The mitral valve is on the left side of the heart. It allows blood to flow from the left upper chamber into the left lower chamber. When the valve is not working well, it may need to be replaced. Healthy heart valves allow blood to flow one way. Diseased valves either leak and cause backflow, or narrow and restrict blood flow. The condition can be life threatening. Sometimes the valve can be repaired. Other times, it must be replaced. Rheumatic fever , other infections, defects at birth, and wear and tear are the most common causes of mitral valve problems. Your doctor will evaluate your general health, and the condition of your heart and circulation. Some tests may include an ECG , echocardiogram , or cardiac catheterization . Do not eat or drink anything the night before your procedure. An incision will be made along the length of the breast bone. The breast bone will be split lengthwise to expose your heart. You will then be put on a heart-lung machine. This machine takes over the work of your heart so that the doctor can stop your heart. Your heart will be opened. A substitute valve will be sewn into place. This valve may be mechanical (metal and plastic) such as a St. Jude valve, or it may be made of tissue. Tissue valves most often come from a pig or a cow. Tissue valves may also be supplied by a human donor or even manufactured from your own tissues. 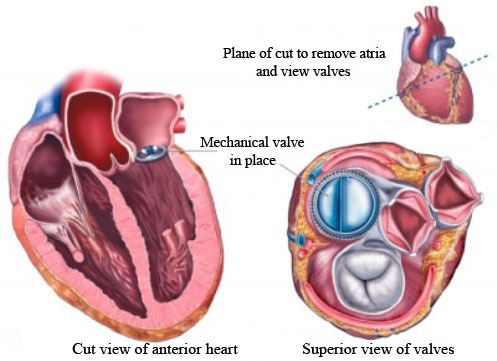 When the valve is in place, you will be taken off the heart-lung machine and your heart will be re-started. The incision will be closed. Newer techniques, including robot-assisted procedures , are being developed. These procedures will be able to do the same surgery with smaller incisions. You will be taken to a recovery room. Your blood pressure, pulse, and breathing will be monitored. The usual length of stay is 8-10 days. Your doctor may choose to keep you longer if complications arise. Take prescription medications such as blood thinners or antibiotics if they are prescribed by your doctor. Antibiotics may be needed before dental procedures and during certain other procedures. This will help prevent a valve infection. You will slowly return to your usual activities over a 4-12 week period. You may also be asked to participate in a cardiac rehabilitation program. Mechanical valves can last a lifetime. Tissue valves last 7-14 years and then must be replaced. If your valve is repaired and you have no complications, you will likely do well and be able to return to normal activities. Mitral valve disease. Society of Thoracic Surgeons website. Available at: https://ctsurgerypatients.org/adult-heart-disease/mitral-valve-disease. Accessed September 15, 2017. Mitral valve disease: stenosis and regurgitation. Cleveland Clinic website. Available at: http://www.clevelandclinicmeded.com/medicalpubs/diseasemanagement/cardiology/mitral-valve-disease. Accessed September 15, 2017. Mitral valve replacement. Encyclopedia of Surgery website. Available at: http://www.surgeryencyclopedia.com/La-Pa/Mitral-Valve-Replacement.html. Accessed September 15, 2017.